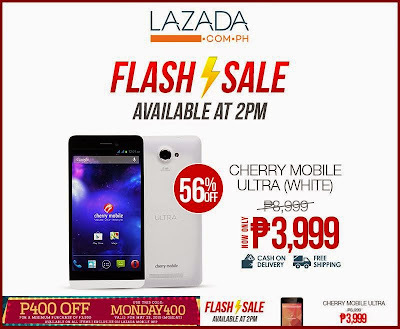 Cherry Mobile Ultra with LTE connectivity is currently on flash sale in Lazada with only Php 3,999 price tag. This popular handset has a regular asking price of Php 8,999. Cherry Mobile Ultra with LTE connectivity is currently on flash sale in Lazada with only Php 3,999 price tag. This popular handset has a regular asking price of Php 8,999; and has been one of the long-standing handsets of Cherry Mobile in terms of following and buyers’ interest. The device was released last year; and until now, it is still one of the company's best LTE phones. You can get the handset in Lazada. But before that you can also check our Cherry Mobile Ultra review. The Cherry Mobile Ultra is a 5-inch device with IPS HD display, 13MP camera and 1GB of RAM. Check out the rest of the specs below.